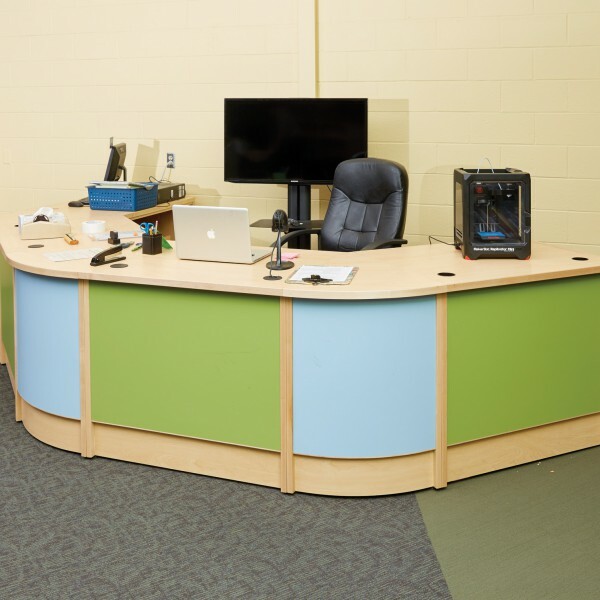 A large, outdated circulation desk was removed to create more usable space and was replaced with a modern ColorScape® desk. 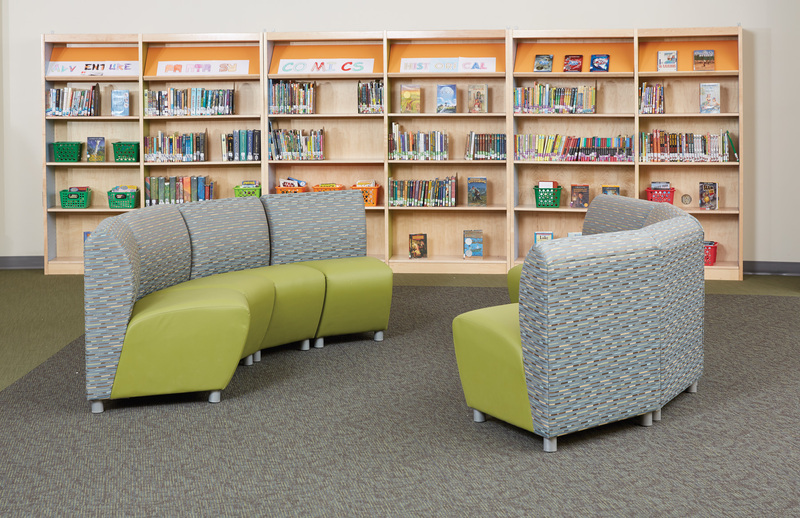 ColorScape® shelving pulls together the space and brings light and calming colors to the library. 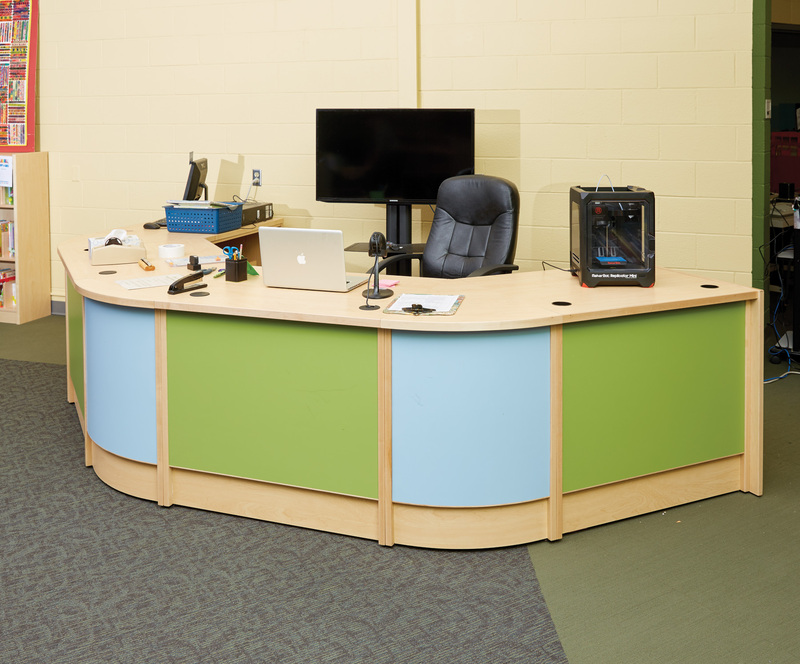 Mobile tables in the library’s makerspace feature storage below for projects and supplies. 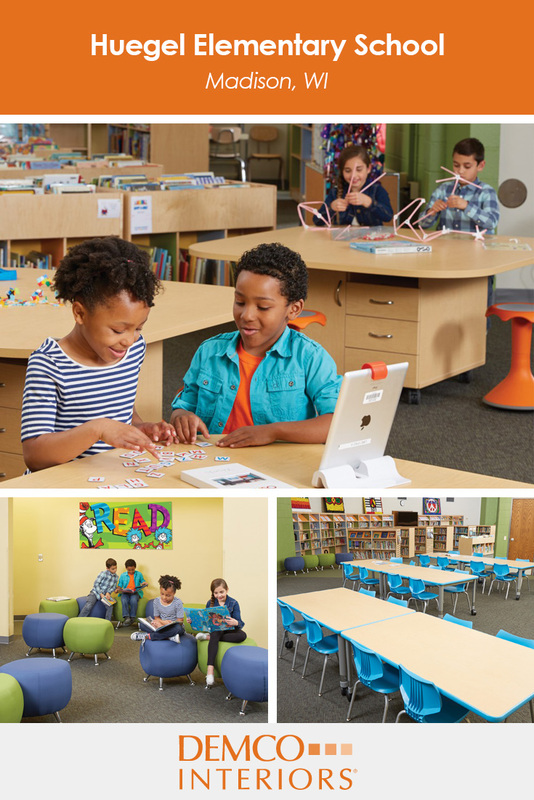 Smith System™ Flavors Chairs add a pop of color and coordinating tables feature locking casters for mobility. 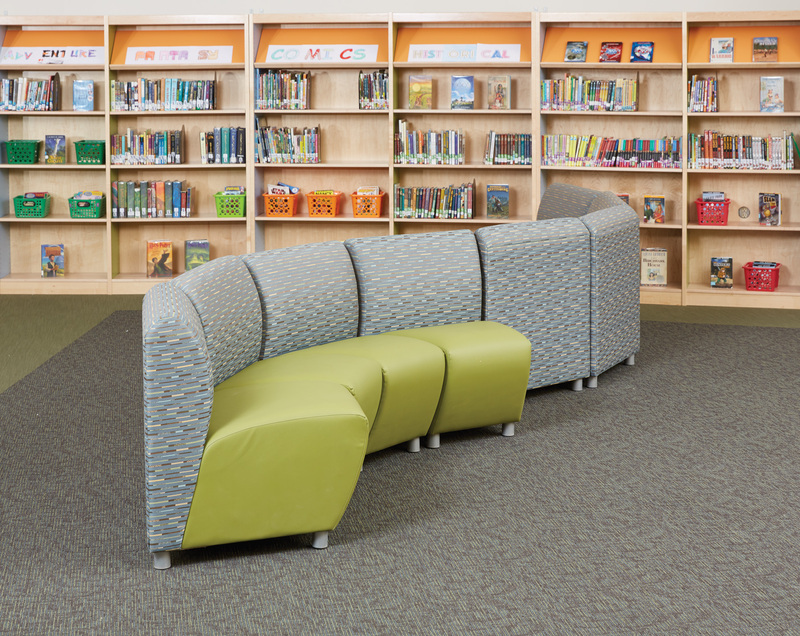 Community Encore Lounge Seating offers the flexibility of small-group seating arrangements. 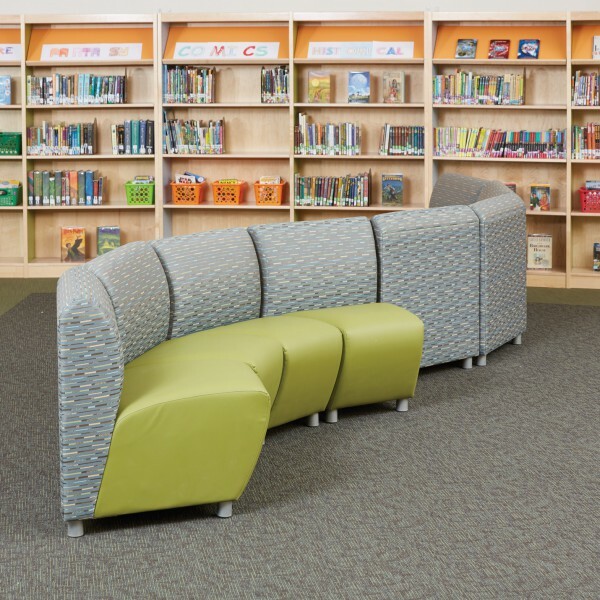 Community Encore Lounge Seating offers the flexibility of different seating arrangements. 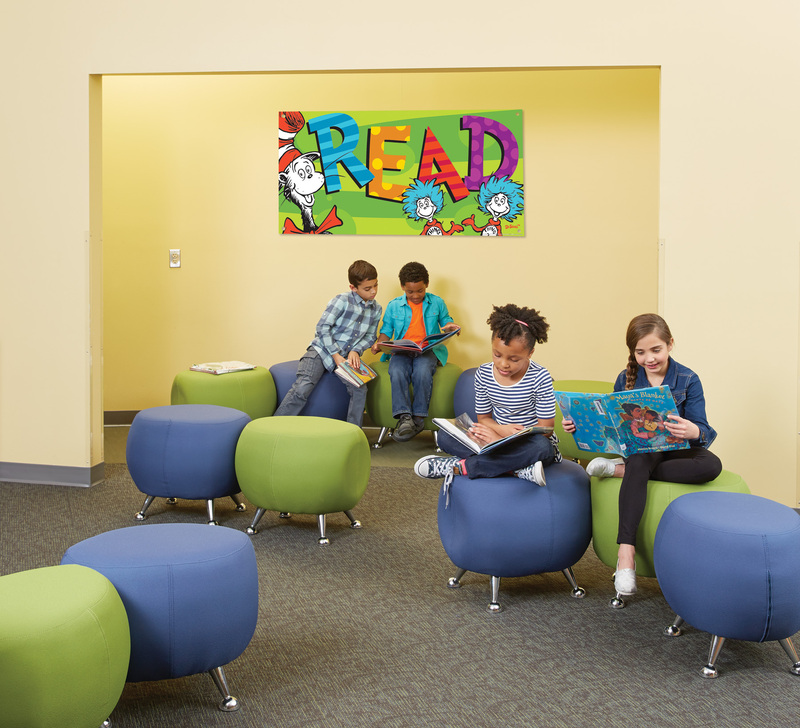 Jupiter Stools can easily be moved from the reading cave to various areas in the library for additional seating. 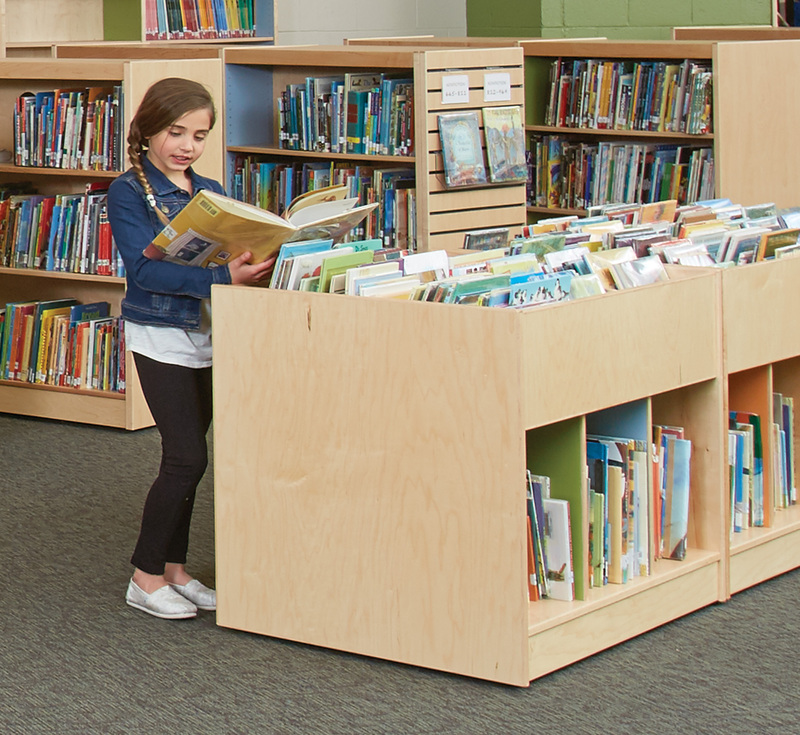 ColorScape® Book Browsers offer book selections at a kid-friendly height. 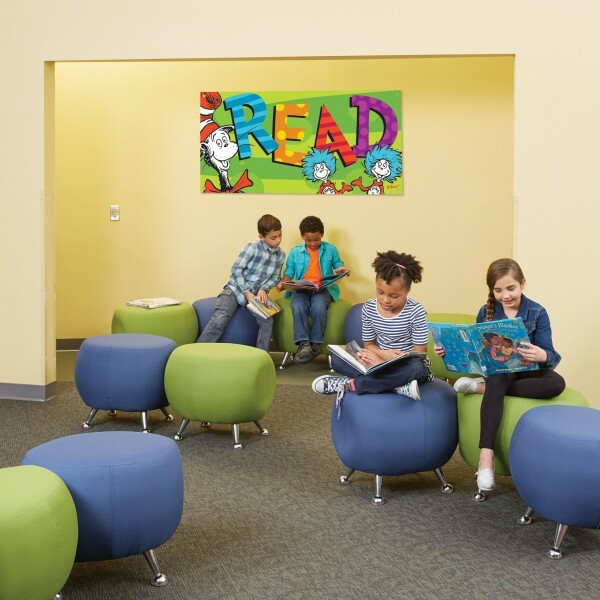 Huegel Elementary’s library features a uniquely circular shape and needed to have areas for independent reading, collaborative work, large-group and small-group instruction, storage areas, inviting book browsing and space for student creation. 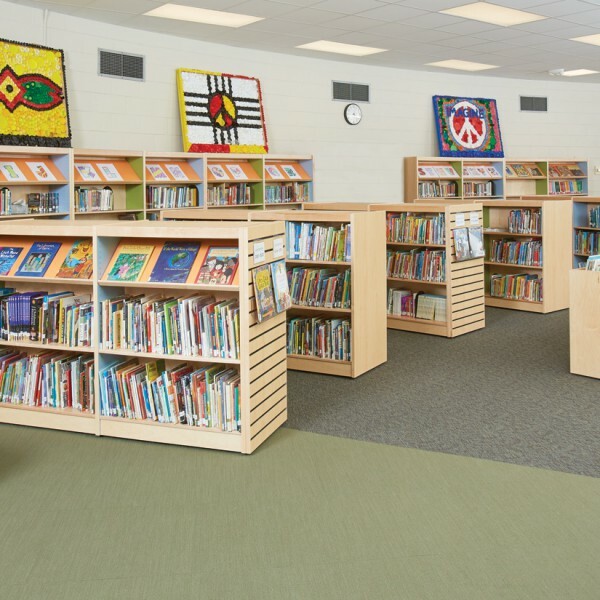 By replacing a large, outdated circulation desk and installing light-colored ColorScape® shelving and book browsing bins, designers invited in light and created a calming atmosphere. 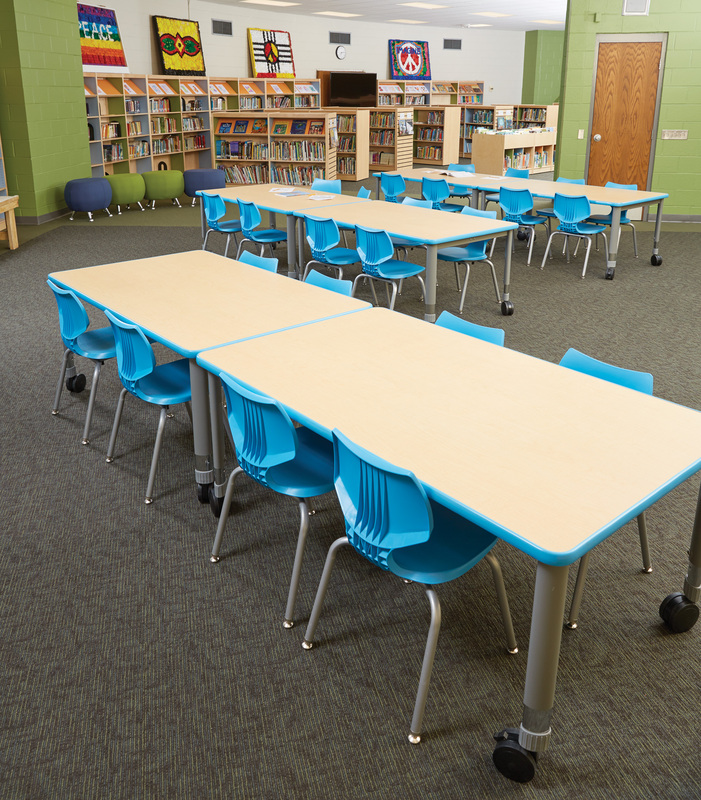 A mobile makerspace, instructional tables, chairs and soft seating completed the library’s new multifunctional, flexible space. 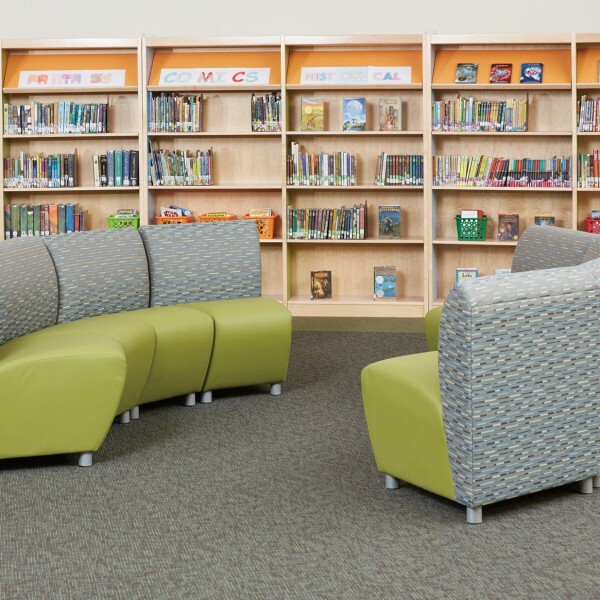 For the complete project portfolio visit DEMCO Interiors. 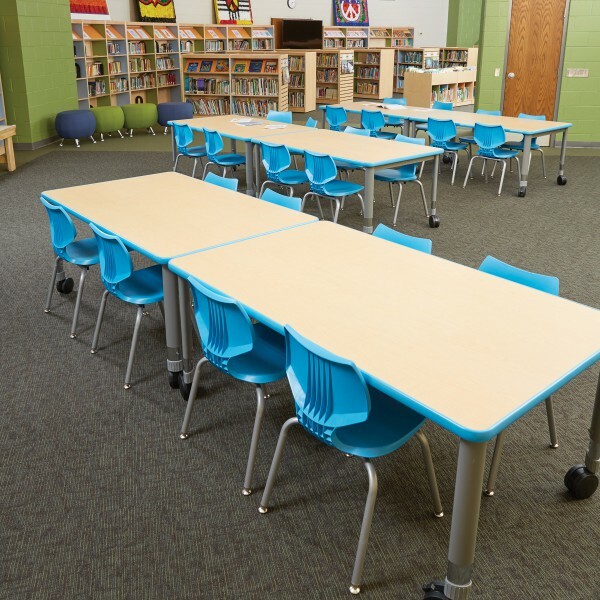 Could you provide me with more information about the tables that are part of the makerspace section of this library. I am also curious about the stools that sit around these tables. Thanks for your help. Thanks for writing. We can definitely get your more information—it’s such a neat space, isn’t it? I’ll have a Specialist contact you to help you with your needs. 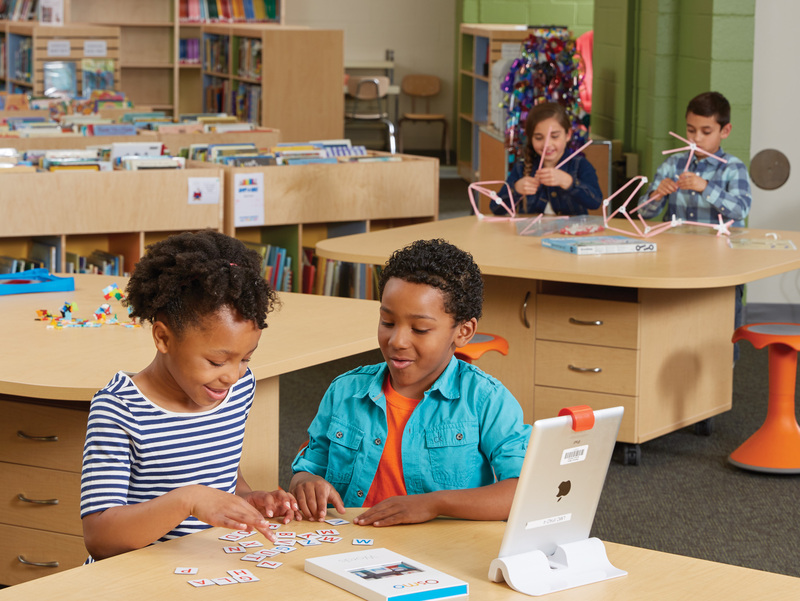 Is it possible to know where I can find the tables with storage under them, where the kids are using IPAD and STEM project? I am really interested in getting these for an early childhood room. I would like product information please. Thanks for your interest, Melissa! 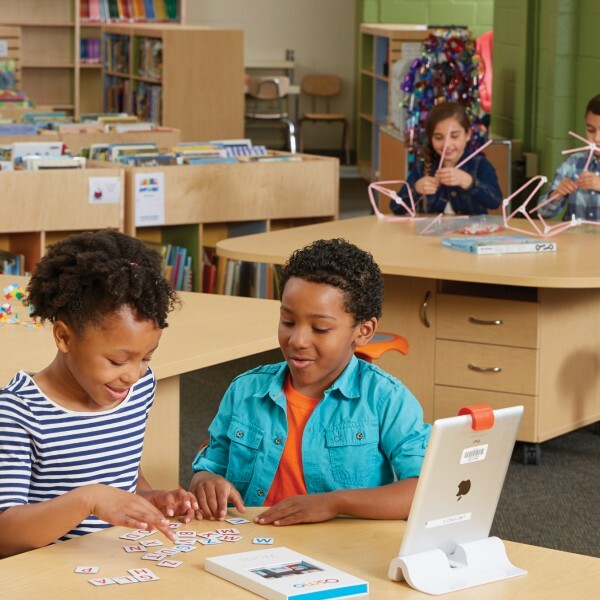 The tables above were custom; however, we have two very similar stock options: Media Technologies Clover Tables and Mobile STEM Table Stations. I’ll also have a specialist contact you to learn more about your needs. Which Smith system tables are those (ones with the flavor chairs)? Those are the Husky Activity Tables. You may also be interested in the Smith System Elemental Tables. Thanks for visiting the Ideas and Inspiration site!